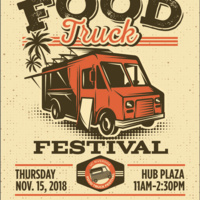 Join us Thu., Nov. 15 (11 AM - 2:30 PM) to experience over twenty delicious, local food trucks! Plus, volunteer to help manage lines and receive a free Food Truck Festival t-shirt! (Email us at mark.claiborne@ucr.edu to volunteer). Fun event, but I'm concerned how the prices are always higher at UCR Food Truck Fests, than they are on the vendors' websites. I feel like they are price-gouging the students!